Home » Posts Tagged "Naeem Kahn"
Crimps in the hair are long lasting. They last longer than curls and waves ironed or set in. Crimps are also fun stuff. Hairdressers love doing them. And they do so for many fashion shows, as seen here photographed backstage at New York Fashion Week Shows from 2012 – 2016. Why more mere mortals and celebs don’t wear them much is something to think about. 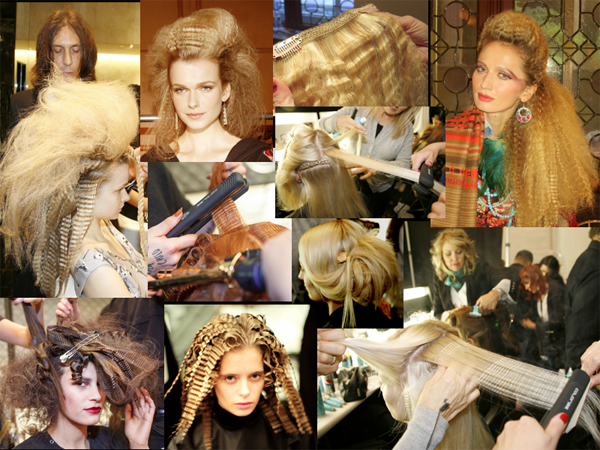 Top Row Left to Right: Edward Tricomi teasing and crimping for a high life at Douglas Hannant 2012 … Tricomi’s finished High Life with strategic crimps here and there … Crimped human hair extension by Sherri Jessee, Intercoiffure 2013 … Jessee’s finished half up/half down Wild West style which is micro-crimped with the extensions added. Center Row: Jon Reyman crimps being crimped at Naeem Kahn Fall 2016 … Peter Gray’s crimpings on a blonde at Badgley Mischka 2013, also Bottom Right … Inset: Peter Gray’s finished Midsummer Night’s Dream crimp with flowers. Bottom Left and Center: Jon Reyman crimps for Big and Beautiful at Naeem Kahn 2016. Stunning stylish romantic earrings by Naeem Khan for his New York Bridal Fashion Week Fall 2018 Show. The makeup lead was Chika Chan, Makeup Pro, who created rich red lips with neutral eyes. Stay tuned for more wonders from head to toe from this great show. 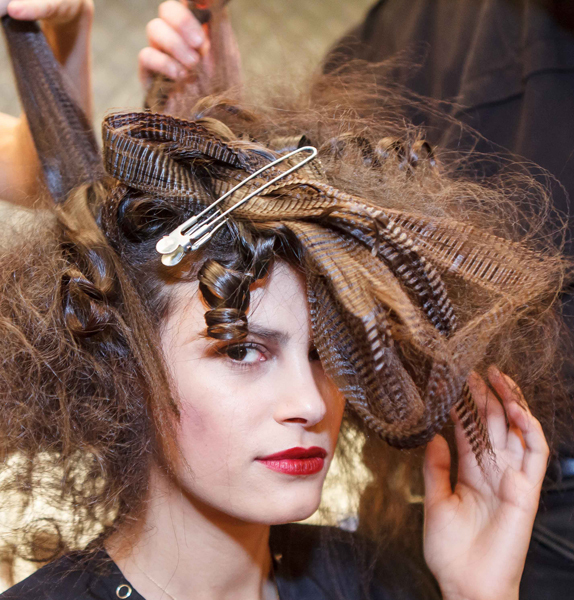 Captured backstage at the Naeem Khan New York Fashion Week show for Fall 2016, this crimp extravaganza – and not finished yet! 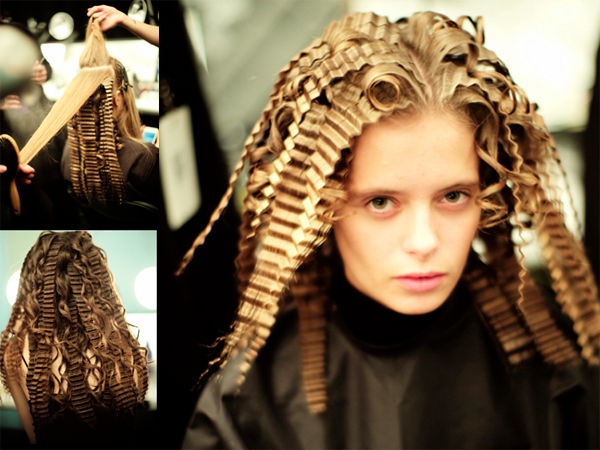 False hair was added, crimped, then brushed out, backcombed, pinned up, shaped and styled. Each head of hair took about an hour to do. 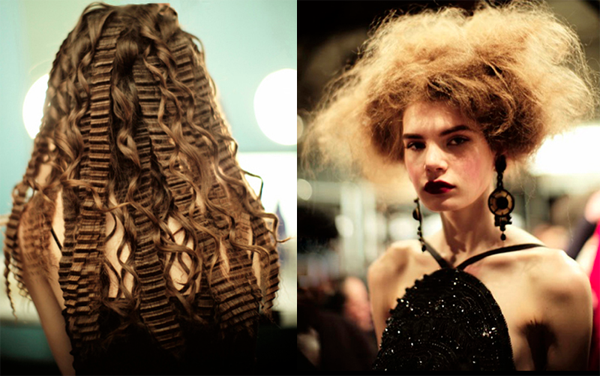 Stay tuned for more crimped masterpieces, some hairstyles in their own right, the finished looks at this show which featured some dazzling, shimmery, gorgeous glam gowns – with big, beautiful hair.